STARWHAL is everywhere! What's next? Hey, whoa… Breakfall had a blog? Let’s get some fresh air in here. Where are we these days? STARWHAL is available on PC, Mac, Linux, PS4, Xbox One, and Wii U. Every entertainment device in your home that we at Breakfall deemed relevant. (Sorry to all the Atari Lynx fans out there.) It’s not the game that modern consoles deserve, but it is the one they need. It took a while but we made it happen. The original version of STARWHAL was made back in January of 2013 at Global Game Jam. Lots of fun was had, many narwhal hearts were pierced, and we ended the weekend with a neat little game. It wasn’t our first rodeo - we’d made neat little games we were proud of for several Game Jams in years past, so we were used to the idea of just making these sorts of things for fun and them not going anywhere beyond that. With that notion in mind, we joked about the idea of STARWHAL taking off and selling 50,000 copies, which was a wild, inconceivable number. And then you came, you saw, you flopped around, and it was good. You all played the crap out of the STARWHAL demo on the site, told your friends, and watched people on Youtube yell at each other. Many of you backed us on Kickstarter, and supported us by buying the game when it was finally released on the platform of your choice. For this you have our unstabbed heartfelt thanks! Lately we’ve been working on something new, and it’s totally, totally rad. It may not make you cry, but it’ll definitely make you laugh. It’ll also test your speed, power, and accuracy. It’s all about... well, you’ll find out very soon. But that’s only half of it. We’re gonna blog more about stuff in development. Stay tuned and follow our social media for a drip feed of random nonsense from game dev life. STARWHAL is about to get a name change, and we’d like to offer some explanation as to why we are doing this. After some pretty serious deliberation, Breakfall is choosing to drop the “Just the Tip” subtitle from our game, STARWHAL. This decision is being made entirely by Breakfall, on its own accord. FEAR NOT! We're still hard at work on the game, and this doesn't come with any other changes to our master plan to bring you the ULTIMATE space narwhal combat simulation. And we’re still excited to have STARWHAL hitting gamers' couches across planet Earth on consoles in 2015! Remember you can already play on Steam. And if you don't have a sweet PS4, PS3, or WiiU in your gaming lair, other consoles are also in the works. So why the change to the name? The “Just the Tip” subtitle was originally the entire title of the game when it was created during Global Game in January 2013. Global Game Jam is an event where a team undertakes the challenge of creating a game in 48 hours. It’s a difficult and often sleepless task! During the jam, we needed to come up with something to name our game as we worked. At that time, Just the Tip both made us laugh, and felt like it (sorta-kinda) described the gameplay. After the game jam we wanted a more descriptive name, and the brilliant pun “Starwhal” seemed to perfectly describe the lovable neon space mammals battling across the stars. We kept the original title - Just the Tip - as a subtitle. Unfortunately, the subtitle itself has been a bit of a contentious issue. It turns out the answer to the question “what’s in a name?” can sometimes be “a massive can of worms.” There are two main reasons we want to drop the subtitle at this point. The first issue is representing the game as adult-oriented when it's in fact totally family friendly. It's a game about colourful, smiling sea creatures poking each other in outer space. In our experience, kids love playing STARWHAL just as much as anyone else! But we've seen some parents with children hesitate around our booth at various events. This makes a certain amount of sense; if they don't know what the game is about, the subtitle can convey entirely the wrong idea. Everyone is free to imagine whatever subtext they like, but the game isn't overtly adult-oriented, and we're happy to have all ages participate. This is especially true as we move to consoles. The second, and for some members of our team the larger issue, is that our dumb joke really makes some people uncomfortable. At some of the events we've attended, either participants or organizers have brought up being uncomfortable with the title. From the beginning, our intention with this project was to have some playful, maybe even immature, fun. The subtitle probably helped us get some attention when the game was initially released, but we don’t think it’s the core of what makes STARWHAL great. A lot of people shared a chuckle with a nudge and a wink at our innuendo-laden subtitle. But some people have much more negative associations with the phrase “just the tip”, and were obviously upset about it. We don’t think all game developers need to censor themselves, but the joke in the title isn’t so important to us that we want to ruin the fun for any significant number of players. As you can probably tell from the game itself, we didn’t take ourselves too seriously when dreaming anything up in our exhausted race through Game Jam, or even in the time during development since. We’re hoping you still giggle at the ridiculous humor as you ride a space narwhal wrapped in a burrito with all your friends and family. With glowing tusks and sparkling flukes, we wish you much silliness and merriment throughout your STARWHAL adventures. We hope you can appreciate our reasoning here whether or not you agree. We appreciate you sticking with us this far, and to all our fans, again we say thank you! See you in the grid! Marvin's Mittens Steam Release Date! Marvin is finally ready to greet you on Steam on December 17, 2014! We're excited that so many people will discover something to love in Marvin's winter wonderland. Go check out the page on Steam right now and add it to your wish list! 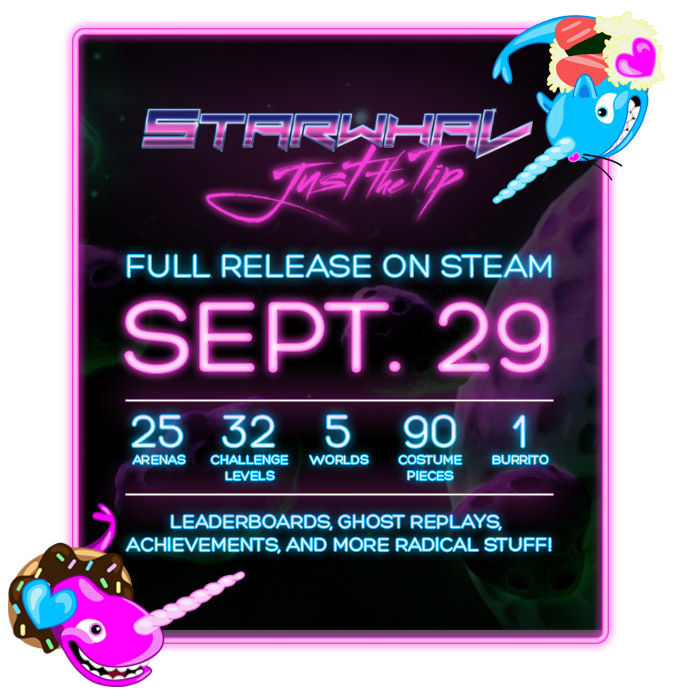 We've announced the launch date for STARWHAL's full release on Steam! See you on September 29th. Wow! We're excited to share with you that STARWHAL: Just the Tip has had its 1 MILLIONTH unique visitor on starwhal.com. Over 1 million unique visitors. That means over 40% of people have decided to return for more STARWHAL action! Over 4 million page views. Thank you so much to our dedicated fans around the world. You guys are so awesome it blows our faces off. For some extra cool news, we've announced the game is coming to Playstation with a post on the Official Playstation Blog! We're excited to keep share with you guys more development stuff as we go forward. Follow us on Twitter and Facebook for even more updates! We are ecstatic! We are just full of joy. Available today, February 17th 2014, you will be able to play Starwhal: Just the Tip on Steam Early Access! Click to check it out! Steam Early Access is a way to play the game early while we are finishing up content and releasing more modes, levels, backgrounds, costumes, and more. You get to play before we officially release the game. How exciting is that?! Here are some more details on what to expect. We are happy to announce that STARWHAL: Just the Tip is coming to you on STEAM in early 2014! Also, we are coming to WiiU and PS4 (and possibly more!) as well! Last weekend a couple of Breakfall teamers went down to Toronto to go hang out with Sean "Day9" Plott and see the Starcraft world championships. First we spent some time with a friend of ours, Farid, who works for Ubisoft in Toronto. He has this amazing exhaustive list of all restaurants he's gone to since his start at the company. He was kind enough to bring us to some of the higher rated places (noted with more hearts in his cell phone), and crash in his place down town. Thanks, Farid! 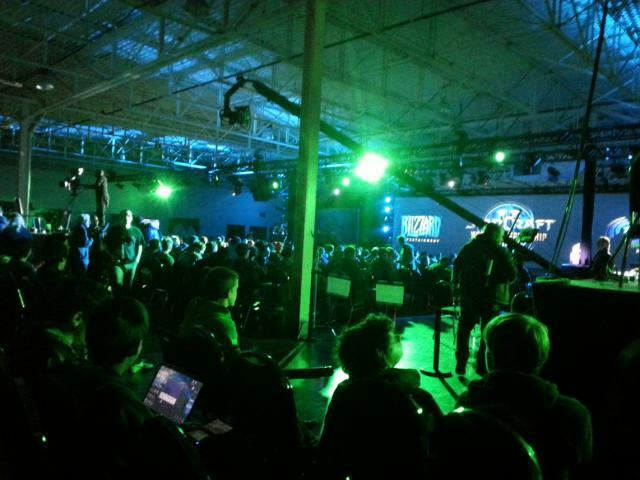 The next day we caught day 2 of the Starcraft World Championship Series at the Toronto Congress Center. It was so cool to be surrounded by people who were as excited to watch some competitive gaming matches as we were! After the tournament day we met up with Sean (Day9) and Brit at their hotel and had a great time goofing around into the wee hours of the night. They were both level 60 giga-baller nerds with +20 charisma - Sean doing tons of great things for the competitive gaming community including running a show that teaches people to be better gamers (and people). 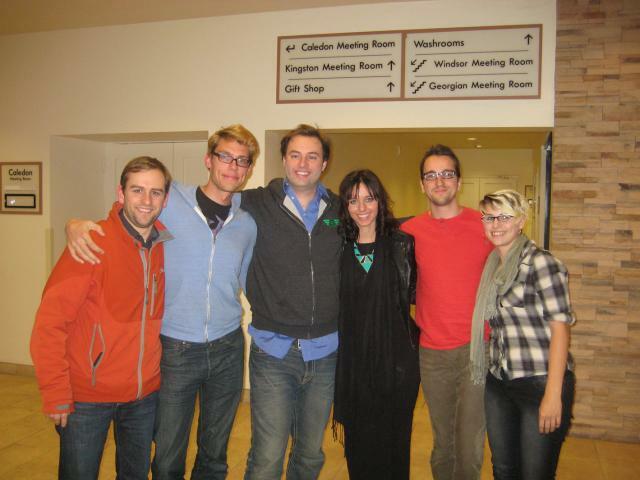 Great to finally hang out with them in person! After hugs and imparting the secret Breakfall props-handshake, we drove back home to Ottawa and got home around 7 in the morning. Woo! 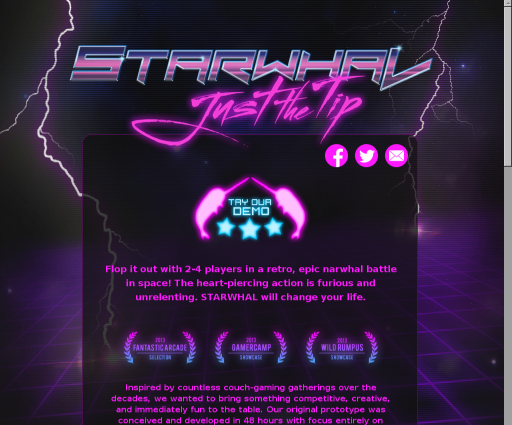 We've got a new, shiny version of Starwhal: Just the Tip website! We'll continue to keep it updated with all critical information about the title's release. Go check it out at starwhal.com! We're super excited that we were selected for this year's Gamercamp festival, held in Toronto from November 1st to 3rd. Right now we're preparing a shiny new version of Starwhal: Just the Tip for crowds on hand at the festival. It will be great to get people's feedback. We'll see you in a few short weeks now!